Wherever there is private property, there also one will find a strong family system. The two institutions are intertwined. 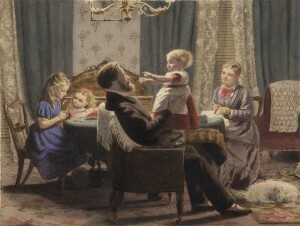 The family household as an economic unit has always been much more important to the development of a nation than the isolated individual. Indeed, we can say that modern economy was built upon the firm foundation of the family and not upon the individual. As noted by Joseph Schumpeter’s book, Capitalism, Socialism and Democracy, “it was not the isolated individual, so dear as an abstract concept to the classical economists, but the household that was the main engine of modern capitalist development. Not economic man but, quite literally, the head of the household working for the present and future of the members of his family, and hence saving and investing in however small degree, is the central figure in the capitalist drama, as in all earlier forms of economy” (as cited in Robert Nisbet, Twilight of Authority, Indianapolis, Liberty Fund, 2000, p. 199). 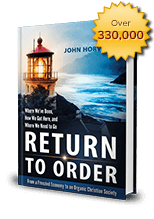 This entry was posted in Featured and tagged America, capitalism, Catholic Church, consumer society, economic crisis, Family, financial speculation, frenetic intemperance, leadership, mechanical existence, Return to Order, Traditional marriage by John Horvat II. Bookmark the permalink.